ENG: Hi, my dear readers! How was your weekend? I have some news: at last I’ve bought a hat for myself. I’ve found it in Zara, it’s the last one) What a luck! But when I backed home and showed my new purchase I was called «King of amanitas». Can you imagine?) Anyway, I don’t care cause I really like my hat! So, forget mushrooms, let’s talk about fashion. What do you think about wearing hats? Do you like it? Some people think that hats become so mass, like maxi skirts or ox blood color. If skirts had been put in the deepest corner of closet, burgundy is not giving up so easily! Also I think the same story will be with hats: we’ll see a lot of girls wearing this accessory. In my opinion it’s really stylish and beautiful item. RU: Всем огромный привет! Как ваши дела? Я наконец-то решилась на покупку шляпы! Эту симпатичную вещь я нашла в Zara, как оказалась, она была там последняя) Вот счастье привалило! Правда длилось оно недолго: когда я пришла домой и показала обновку, меня обозвали королем мухоморов. Ну и все равно! Мне она очень нравиться! Ладно, оставим грибы в покое, давайте поговорим о моде. Как вам шляпный тренд? Многие жалуются, что этому головному убору грозит массовость, как это случилось с юбками макси и бургунди. Юбки уже висят в дальнем углу шкафа, а вот наряды цвета красного вина мы еще будем выгуливать не один месяц. И еще увидим большое количество разнообразных шляп и шляпок на уличных модницах. Siz şapkalar konusunda ne düşünüyorsunuz? Bazı kişiler şapkayı pek tercih etmiyorlar.Kimileri ise elbiselerinin olmazsa olmazı olarak görüyorlar.Bence şapka elbiseyi tamamlayan bir obje ve cok güzel duruyor. ohh you look amazing honey! I really love your hat! You look stunning! Great ensemble! You look adorable! I really like the combination of the colours of the sweater and the pants! 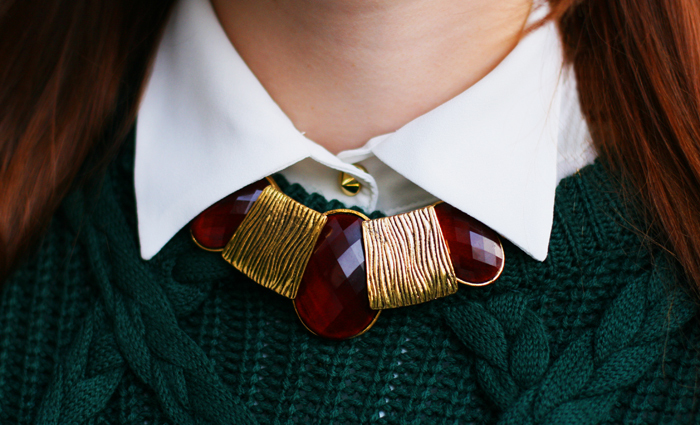 Two of the most suitable colours for this fall! And this hat is really cute :) Looks so good on you ! love the combination of colors, and of couse, love the hat! I ofter wear hats in autumn, too :) kisses!! GREAT outfit. The hat is fun, but I am really LOVING your shoes & necklace! wow that emerald and red is such a dream combo and i adore your hat! Wonderful outfit cute pants and shoes!! Hi dear Vic, your hat is lovely. A strong trend for many seasons to come, in my opinion. So did you like Skyfall? I loved it! Great movie! amazing look!! !love the colors!!! and the hat is so cool!!! The hat looks good on you. Great buy. Wow beautiful outfit, great combination and your necklace is beautiful too. Love the hat! Great look. Love this outfit and it's a lovely combination of colors. So lovely sweater. Love your hat too. Поздравляю с покупкой! Шляпа тебе очень идет, а свитер сказочно красив! И сочетание зеленого с изумрудным ну очень идет! 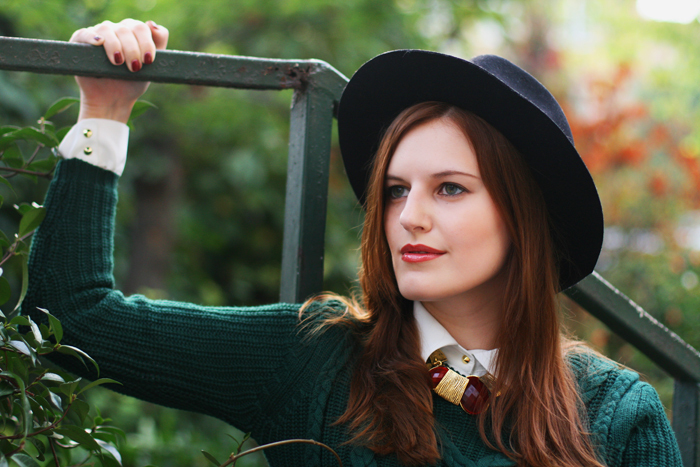 The hat really suits you and I love the autumn colour combination of your outfit. Thank you for suggesting we should follow each other. I've been reading and enjoying your previous posts and I'm delighted to be your newest follower! Hi sweety, these are such gorgeous shades you placed together, they look sumptuous and comfy. You look adorable in the hat! I was just thinking how I needed to get a hat this year--love the style you're wearing and your whole outfit is so pretty and fall-like. I love the rich and bold colors. You look so pretty! I love hats!! Its all about finding the one that looks good on you. 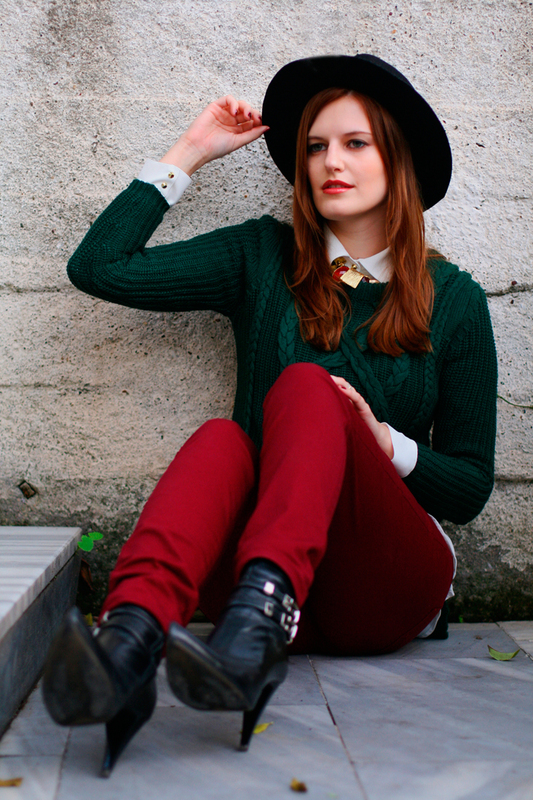 The picture of you is unbelievable I love the emerald green with the red and the hat looks very chic. Thanks for such a lovely compliments! superb color combination, you look soo stunning! Ты такая красивая в этой шляпке! И фотографии чудесные: яркие, легкие. Очень понравился образ. Целую. I LOVE the contrast of colors, and LOOOOVE the boots, Viktoriya! This will be going up on my blog later today as one of the looks I love today. I hope you will check it out later! Wow, this is great! The pants and sweater together - just pefect! I love it! And te hat makes it even better! SO nice and lovely! Amazing photos,i love your style!! I need hat like yours ! The colors of this outfit are so striking and beautiful !! And the hat suits you really well, nice buy. woww amazing look dear! 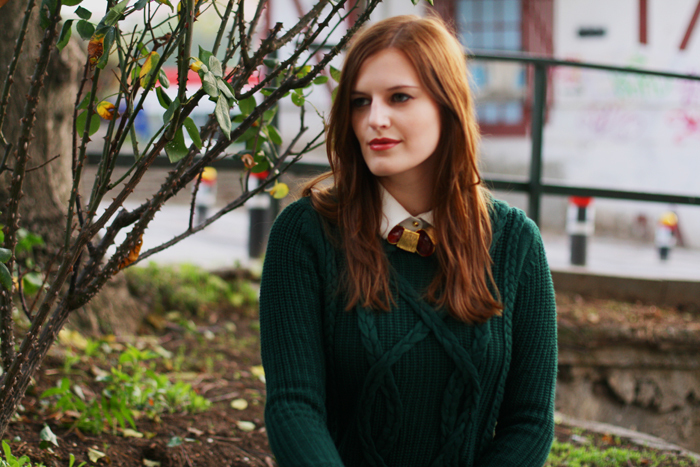 !in love with that green sweater!! These pictures are amazing, and your outfit is absolutely gorgeous! I love how the colors contrast! Burgundy's still trendy nowadys and hat? Its forever. It males a statement not just fashion. Dont mind what other people say. As long as u feel like wearing a hat go for it. I love your hat and your necklace too! !nice outfit!! Hi dear, thank you for your comment today! Боже мой, какая красота! Какие цвета! Потрясающий образ! Как для обложки журнала! Буду рада видеть и у себя в гостях! You are very beautiful, beautiful hair color. I like your outfit! Love the colours in this outfit! it;s so perfect for fall! Love this combo a lot, you look amazing dear. Your black green weater is a sepecial color..
Great style - angelic beauty! Thank you for stopping by leaving a sweet comment! Stop by soon! Perfect hat ♥ Loove this sweater ! I love the hats very much. However I don't like hats on me. 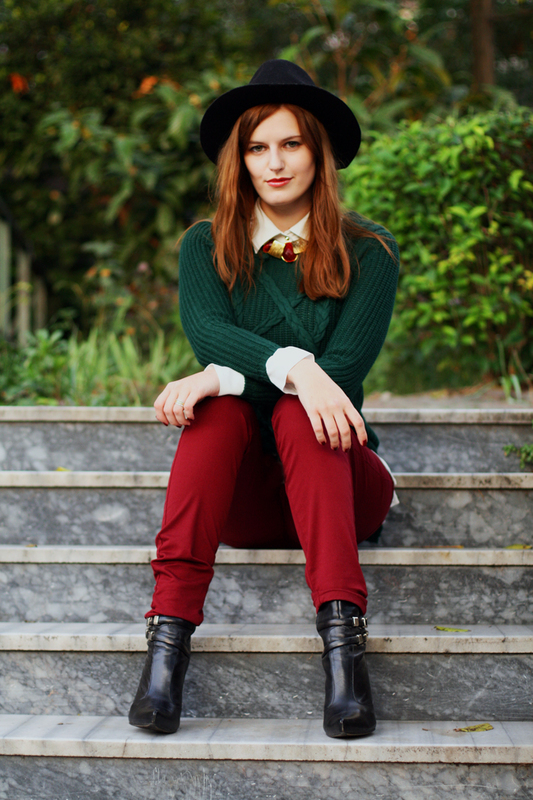 I don't think so the hats look good on me:( You look very nice in your burgundy trousers and green top. The colors are very nice. check my blog and if you want we can follow each other on GFC, FB! Love the outfit! the pictures are amazing and so is your blog! love the hats as well, plus beanies and caps. 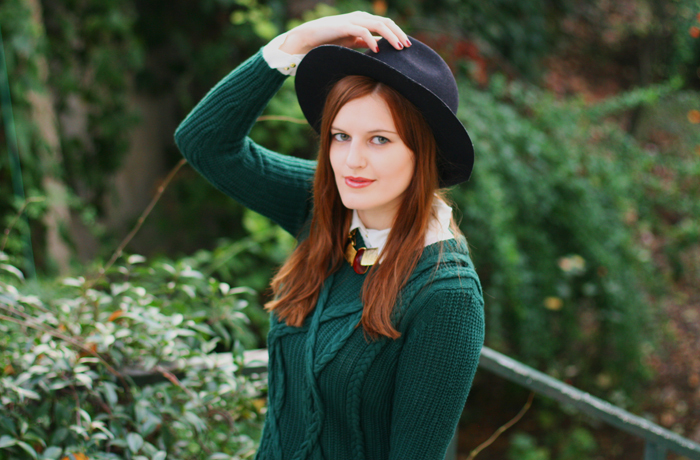 I LOVE hats and it is right on trend this season as well! This outfit is killer! Especially, the necklace as a collar! I love that outfit, colors and everything! just discover your blog and I like it! Безумно нравится сочетание красного и зеленого!